Prior to installing the solar panel for an attic fan I selected two candidate locations for mounting the panel. The first location was up on the main roof of the house. Though this seemed like the natural choice there were a couple of issues with this plan. The first is simply that it would be a bit of a challenge to safely access that part of the roof. I was also hesitant to do anything that would potentially compromise the roof. The second location was on the west side of our back porch roof. By placing the panel there it would be easier to install and it also wouldn’t be visible from the street. Placing it on the back porch roof became the more desired location but I was uncertain whether or not the panel would end up being shaded by the house during most of the day. How could I determine if the panel would be exposed to direct sunlight most of the day? Well, it turns out that I already had an app that could do this. It’s an astronomy app called Distant Suns. Typically, I only use it the night of an annual meteor shower in order to determine where the radiant for the meteor shower is. 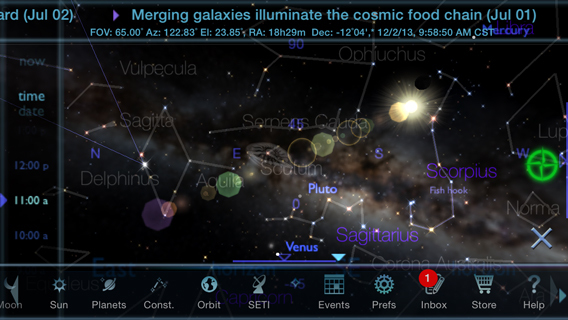 Fortunately, the app can also calculate positions of celestial objects, including the sun, at different times of the year. Using the app I was able to advance the time and also the date to find the exact position of the sun relative to where I was standing (and oriented). For example, I was able to advance the time to 11 AM and then hold the phone up and move it around until the marker for the sun was visible. Sure enough, I was able to determine that the solar panel would receive direct sunlight most of the time when mounted on the back porch roof.